Could Self-Driving Bulldozers Help Fix A Housing Shortage? As the yellow and black bulldozer-like machine zoomed around the construction site preparing the ground for 700 new houses, all that was missing was someone in the driver’s seat. Self-driving fever has spread from the Bay Area’s roads to its construction projects, prompting yet another industry to grapple with the excitement and risks that come with this technology. San Francisco-based Built Robotics says its autonomous track loader, which has been leveling ground at Bay Area construction sites since last fall, will be a safer, more efficient alternative to using human drivers — and the company plans to expand its technology to other heavy machinery. Built Robotics is one of a host of companies seeking to use technology to transform the construction industry with everything from autonomous vehicles to drones to cutting-edge software. Some experts say these innovations could address a decades-old problem — construction productivity has stagnated, while a shortage of housing is driving Bay Area home prices to unfathomable heights. But critics worry the advancements pose safety risks and will push workers out of high-paying jobs. While productivity in U.S. manufacturing, retail and agriculture has increased as much as 15 fold since 1945, the construction industry has remained flat, according to a 2017 report by consulting firm McKinsey & Co. A January report by the Bureau of Labor Statistics paints a rosier picture — rates of productivity for building single-family homes increased at a rate of 1.1% per year between 1987 and 2015, compared with an average of 2.2% a year for other industries. Concord, Calif.-based Independent Construction would like to improve those productivity numbers. 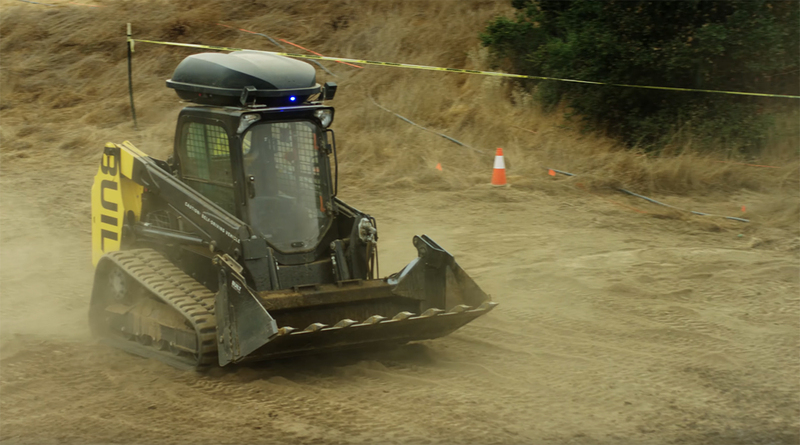 The company tested Built Robotics’ autonomous track loader last month, using it to excavate a site in preparation for 700 new single-family homes in Lathrop. The model they used, named Mary Anne, is an off-the-shelf machine fitted with lidar sensors, flashing blue lights and a computer “brain” that sits in a bin on its roof. For now, the machine operates with a Built Robotics employee in attendance. Eventually, the company expects the machine to run on its own, supervised by a foreman standing nearby. There were snags at first — Mary Anne’s work wasn’t precise enough, leaving the ground rough — but the work got better each day, Independent Construction project manager Eric McCoske said. While it’s not there yet, McCosker said he could see the self-driving machine saving time over a human operator. Jackson Buck, a project superintendent for SRM Construction who works jobs in the Bay Area, was less optimistic. Construction crews on large, open sites already use semi-autonomous, GPS-guided equipment, with someone in the driver’s seat. But when doing deep digging for a heavy excavation project, the variables and unknowns make that type of technology less useful, he wrote in an e-mail. Built Robotics is charging a discounted rate for developers to use its autonomous track loader as part of a pilot program, and the startup hasn’t determined what the going rate will be once the technology is finalized. But Ready-Campbell expects it to be cheaper than renting or buying a regular compact track loader and paying someone to drive it. It costs more than $100 an hour to rent and staff such a machine in the Bay Area, he said. Bobcat sells the machines for $63,000, according to its website. Built Robotics is breaking into the construction industry just as self-driving cars — touted in some circles as the future of transportation — are facing intense scrutiny over safety concerns. Uber in March suspended testing of its autonomous vehicles after one struck and killed a pedestrian in Arizona. A large construction machine potentially can do more damage than an Uber, said Jim Riley, a district representative for the Operating Engineers Local 3 — the union representing workers who drive those machines in Northern California and beyond. But construction sites tend to be controlled environments fraught with fewer obstacles than busy city streets, Built Robotics’ Ready-Campbell said. The company says its autonomous track loader, which is programmed to shut off automatically if a human steps into its work area, actually will reduce workplace accidents. Mary Anne also raises the same fears present whenever a robot enters a new industry — that humans will lose their jobs. That prospect makes this type of tech “very scary,” Riley said. Still, it will take a long time for companies such as Built Robotics to make their self-driving technology accurate enough — and cheap enough — to replace human workers. And when they do, many of those workers can transition to tech-centered jobs overseeing the robots, Riley said. The Bay Area also is facing a pressing shortage of construction workers, which Independent Construction’s McCosker says has left his company lacking heavy-equipment operators. Robots could help augment his thin workforce, he said, and allow the company to take on more jobs. Self-driving machines aren’t the only new technology Independent Construction has up its sleeve — the company also uses drones to measure progress on sites workers are excavating in preparation for development. An employee flies a drone around the site once a week, taking pictures that are sent to Mountain View-based startup TraceAir. The startup analyzes the photos and compares them with last week’s photos and the project’s original blueprints, allowing Independent to see if its work is on track, and to avoid mistakes. Before the drones, an Independent employee had to do that on foot, walking the site with a portable GPS measuring device, McCosker said. Milpitas-based developer Devcon brought its business into the 21st century by ditching bulky paper blueprints in favor of drawings uploaded to the cloud and accessed via an iPad. The team uses PlanGrid, a San Francisco-based startup founded in 2012. Before PlanGrid, workers schlepped massive stacks of constantly changing documents, Vice President of Construction Andy Schatzman said. “Physically, you would need a cart to take them all out to the field,” he said. And that got expensive. Devcon spent more than half a million dollars on printing for a Hyatt job in 2000, Schatzman said. Today, the company barely prints, cutting that cost down to about $15,000 for a project. While the construction-tech revolution is in its early stages, Aaron Jacobson, a partner in venture capital firm NEA and an investor in Built Robotics, expects plenty of other venture capitalists to jump on board.